Your home office is worse than a cubicle in a call-center? You need to fix that before you lose your marbles. There are a lot of low-cost changes you can make, and surely keeping your sanity is worth a little bit of cash. An office space should always be both functional and comfortable. But a home office space should be even more so. You are trying to find a balance between being in your house and so in a relaxed environment, and in a place where real productivity takes place. Finding that sweet spot between the two can be pretty difficult at times. Here are ten tips for making that home office comfy and productive without all the fuss. Pictures, framed art, a stereo with your favorite music… these are all great little personal touches you can add to your office to make it feel like your own little space. That kind of customization will make you feel good about being there. Just make sure those things won’t distract you from your work and don’t crowd your office. Want a quirky look to your office? Try tossing in a couple of bean bag chairs. Cheap, surprisingly comfortable and a lot of fun, they are a great style of furniture for any space. Plus, they are easy to put up and out of the way when you need more room. So if your office is a shared space, it is a good alternative to permanent furniture. Our brains are made to react to color in an emotional way. Which means we should take extra care to put certain hues in certain rooms to manipulate our impressions of our environment. To give your office a feeling of high energy, try something bold and bright like red, orange, gold or yellow. For calm and serenity try greens, blues and purples. For a modern and efficient look to promote productivity, go minimalist and try black, white and metallic tones. Metal filing cabinets are so 80’s. Get a more modern and attractive look, while keeping everything you need in its place. All you have to do is get a bit creative in your organization. For example, this hanging shelf organizes while keeping things out of the way and using space that would otherwise be wasted. This one uses a shoe organizer on the back of the door. Here are a plenty of more DIY organizing ideas for your home and office! Speaking of empty space, you should aim to use as much of it as possible. Shelves and cupboards on the wall, the backs of doors, closets, underneath the desk… the smallest change can make a huge difference in the functionality of your office. Get a sign for the door letting people know when not to disturb you. Take your pet out of the room. Dogs and cats are an enourmous source of distractions when you are trying to work at home. Every home office should have a small area for taking a break while in the same room. When you leave your home office you have a mass of temptations for procrastination surrounding you. So you want to be able to stay on task by remaining in the room as much as possible. Add some creativity boosters like a chalkboard, paint and paper you can use to step aside your desk and rethink any issue that comes around. Have a comfortable chair or sofa, maybe a small space to stretch or do yoga, or somewhere to read. You might even want to reward yourself for working hard by allowing yourself a quick burst of exercise. Don’t forget that you can quickly load up a Zumba class on YouTube — if you have the space clear in advance you’ll be ready to go. Have you ever heard the expression “A cluttered desk is a cluttered mind”? You may have wanted to punch the person who said it in the face the first time you heard it. But it holds a lot of truth, and you will work more productively in a clean and tidy space. Make sure you keep things organized and maintained. On that same note, be sure to work in an area where you can’t easily see all of the household chores you need to do. If you have a huge pile of unfolded washing in sight it will distract you from getting your work done. When you are feeling hungry you probably put off eating to keep working. Which is actually going to kill your energy and make it harder to focus. Have your snacks ready with a small kitchen area of your office. Put in a mini fridge with water, healthy snacks (and maybe some unhealthy ones), and a coffee machine or electric kettle. Try preparing a few boiled eggs or a sandwich ahead of time. Eating one substantial snack quickly will leave you ready to attack your work again. Too much florescent lighting can be murder on the eyes, and raised levels of stress. 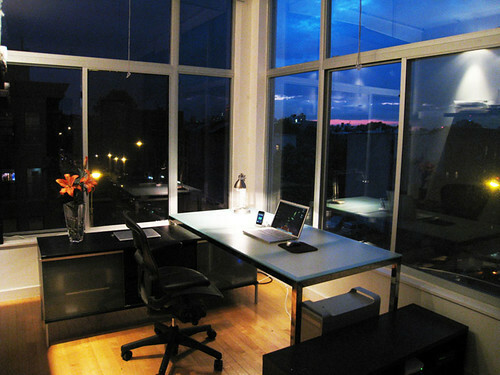 If you have a window in your office try keeping it open regularly to let in natural lightand fresh air. If you don’t have a window, or if it is shaded, try adding a light bulb that simulates natural lighting. Get a large desk. Forget anything less than 30 inches deep. Used office supplies stores are the best place to buy decent-sized desks. Lash out on a really good new chair. I spent 300 euro on a chair and only 80 euro on a curved corner desk with a steel frame. Prevent RSI by throwing your mouse away. Get a trackball instead, you will never go back. A trackball lets you move the cursor with a finger roll of a ball, while resting your wrist and forearm on the desk, a much more natural position than with your hand resting on a mouse which leaves your wrist unsupported. Do you have any tips for making your home office comfy and productive? Let us know in the comments. You can set up a schedule for your projects and yourself, it will keep you focused on the work and avoid thinking on all the house chores that need to be done. It will also be good for all the others in the house. If they know when you are working, they will avoid becoming a distraction for you. And you will be able to spend more quality time. Thanks a lot for my awesome helpers who were adding their tips to this article: Philip Turner of Time Money Problem, Angela Alcorn of Online Careerist, Leticia Perez of Trucosviajeros. Please add your own tips in the comments! Had a good laugh at the photo you’ve used as at the moment my desk is covered with papers and books!! You might have inspired me to do some housework. Thanks for a great article with lots of actionable ideas. I use a lot of these and think it is particularly important to look after your health (as Phil mentions) by making sure you have a good chair and mouse. It is important to have your computer, desk and chair set up properly to minimise strain. I suffer a lot with joint pains so I have an expensive office chair which is fully adjustable. I also use keyboard supports to keep my wrists in the optimal position if I am typing and use a vertical mouse system (at times I use a microphone and voice commands if I’m in lots of pain). I’ve also adapted a plastic really useful box system on wheels as a mobile desk that allows me to work while standing up with everything at the right height for me. haha! Say what! I am still not there organizing my work space too! That article did work as a good motivation though! Thanks for the contribution, Elaine!!! !